As far as technical analysis methods go, Ichimoku or by its full name Ichimoku Kinko Hyo, is one that’s usually put into the “bizarre” box. It has several peculiarities that make it very different from other types of indicators and oscillators. It has also inspired several theories based around it; namely Ichimoku time theory and Ichimoku wave theory. In this post I’ll take a simplified look at this indicator and show how you can make use of it. Ichimoku can be a bit bewildering to start with because of the various outputs it produces. Once you get to know the meaning of each part it is quite straightforward. It isn’t necessary to memorise what each and every line means but it does help to understand the basic properties. I’m not going to explain the formulae or ideas behind each line. As for the Japanese names, I won’t even go there. If you’re interest in learning the theory and line derivations, then Kumotrader is an excellent resource. Figure 1 shows a typical example of Ichimoku output. This is on a 4-hour GBPUSD chart. When you split the indicator up into separate parts it becomes much easier to understand. So let’s look at each of these three components. The two main lines are what I’ll call the equilibrium lines. I find it easiest to think of these together and refer to them as the fast line and slow line. They are derived in the same way but are at a different scale. These two lines are comparable to the fast and slow moving average but they do have some important differences. Traders see the interplay between these two lines as a gauge of things like momentum, pivot, support and resistance. The chart in Figure 2 shows the equilibrium lines with everything else removed. The fast line is red and the slow line is blue. As you can probably see from the chart, these two lines look much like a fast and slow moving average. But actually these aren’t simple average lines. Each line is the average between the peak and trough over a certain span. This might seem like splitting hairs but actually it gives the lines some unique properties. The peak and trough in a chart can stay the same for some distance; until the price touches a new high water mark or low water mark. This means the equilibrium lines will often have a “step like” development. Figure 3 shows how this works. In this example, I’ve used a span of 30 bars. Between points 1 and 2 the peak and trough over the span stays the same. The price is ranging between the high water mark and the low water mark. At point 2, the price touches a new low. Thus only at this point will the line change. It moves down a notch because the new low water mark is lower than the previous one. Compare this to the orange line which is the 30 bar moving average. This line is smooth and continuous. This difference is a deliberate part of the indicator’s design. The idea is that using the price extremes creates a more stable measure of price equilibrium. 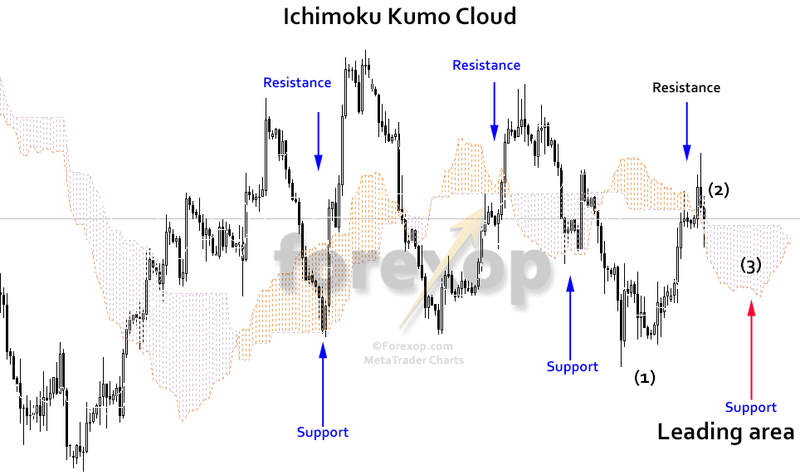 Users of Ichimoku say this gives a stronger indication of support and resistance. An interesting point is that the equilibrium lines do line up with the 50% Fibonacci retracement. The 50% retracement line is considered to be a strong candidate for price pivots. In other words, it’s a probable area for support and resistance to develop and turning points. 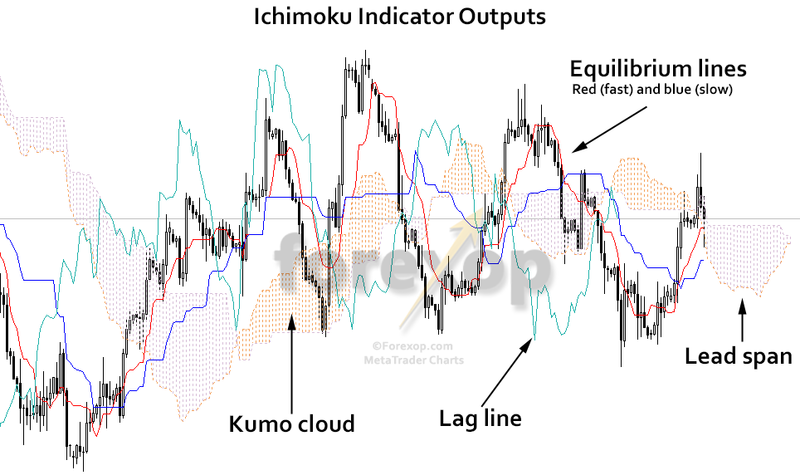 Kumo cloud is the shaded part of the indicator output and this “leads the price”. This gives the Ichimoku its distinctive appearance. The “cloud” is made up of two distinct lines which are shifted forwards on the chart. As with the equilibrium, you can think of one of these as a fast line, and the other a slow. The way to think of the cloud is as a reflection of where the average price band has been in the past. Traders use this to try to figure out where it is likely to go next. The cloud is a “price attractor”. This idea is based on retracement and on the idea that market patterns tend to repeat themselves. The price tends to retrace to former levels and these are often revisited several times before a breakout occurs. For example, if you look at Figure 4, the lead span (3) shows a dip just in front of the current price. This shaded area is a reflection of the levels the price was at in the past at (1). In this case the cloud reflects the dip that took place just before the current price peak (2). A kumo trader would predict that the price will retrace back to the shaded area (3) with a higher probability than rising again beyond (2). This is explained later in the example. The final line is a bit obscure. It’s a lag line. You might look at this line and think it looks like a wonderful signal to trade on. Don’t be fooled. It can’t be traded. This is a delayed line. It’s a reflection back of what’s already happen – otherwise known as a repaint. The lag line is simply the current closing price, projected backwards in the chart. If you look at the front of the chart you’ll see it has no values for the first few bars. Figure 5 shows an example of the lagging line (in light blue). It’s rare to have an indicator that actually creates lag by its design. 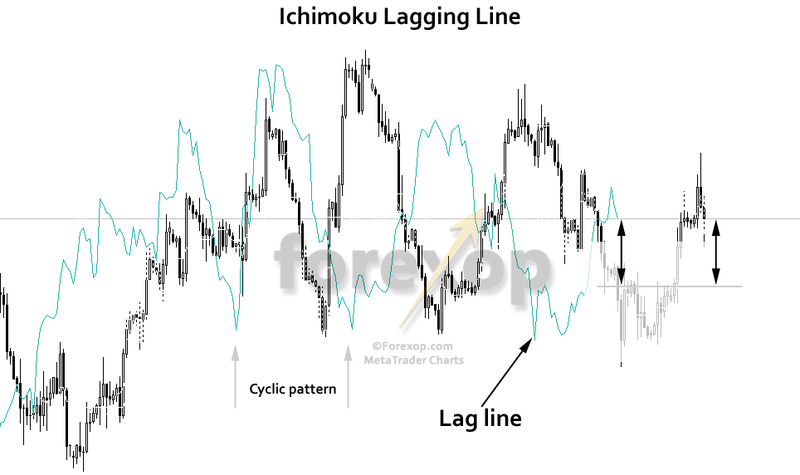 So why does Ichimoku define this line? The first is the easiest to understand. With trend confirmation, you would just take the difference between the current price and the last point in the lagging line. In Figure 5, this distance is shown with an arrow. A positive value tells you the current price has moved upwards and by how much. A negative value tells you the price has moved downwards over the span period. This might be useful in cases of automation where you don’t have any other way to get at the price history and just need a quick reference. The second use for the lagging line is in detecting repeatable patterns. As Figure 5 reveals there seems to be a cyclical movement going on at least during some sections of the chart. The lagging line exposes this because its peaks or troughs will line-up with the peaks and troughs in the price. Thirdly, it acts as a final arbiter. It’s a confirmation in a trading system that the trend is indeed where you expect it to be. We’ve looked at the lines. 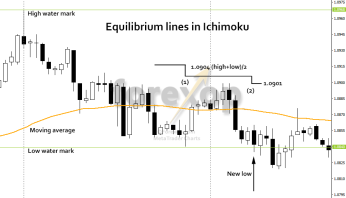 Now what is the best way to make use of the Ichimoku in a trading situation? Though as I’ve shown above, it does this in an unconventional way. Each of these components provides valuable perspective on which to trade. 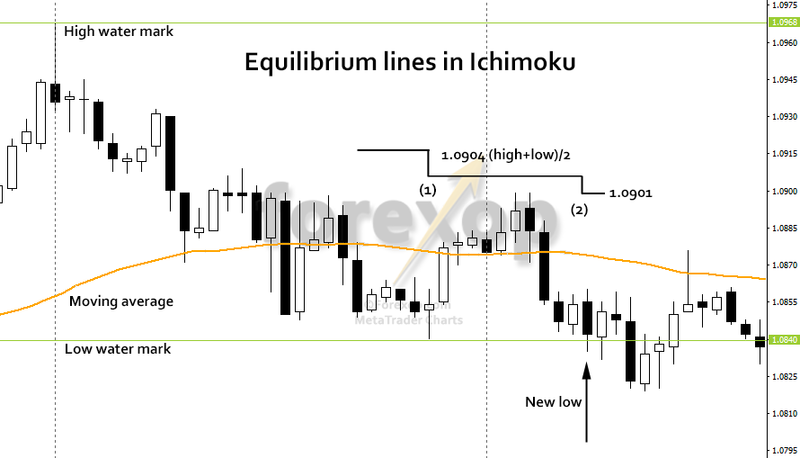 Trend: The equilibrium lines measure trend direction and rate of change at the current time. The cloud predicts trend direction and rate of change in the future. Crossovers in these – also called “twists” – give strong signals on market turning points. For example see Figure 6. Support and resistance: The cloud and the equilibrium lines provide a good forecast of support and resistance. The cloud is your “crystal ball” because it projects further ahead providing a price envelope. The “flatter” and longer the edge on the cloud, the stronger the line of support or resistance. Volatility: Like the Bollinger band, the cloud’s bandwidth is a measure of market volatility. In other words the amount of unpredictability that’s present. A wide or deep cloud means more volatility and less certainty on direction. While a narrow, flat cloud means the market is more stable. Kumo traders talk a lot about equilibrium. What this means is that the cloud is used to gauge the level of “market balance”. When the price is above the cloud it indicates a bullish market. When the price is below it indicates a bearish market. If the price is in the middle of the cloud, this is a kind of no man’s land. The cloud is also considered an “attractor” in that large gaps between price and the cloud will tend to close. So for example if the price has extended far above the cloud this is a signal that a downward correction is likely. Figures 4 and 6 show some examples. As an example, take the chart from Figure 4. I took that snapshot yesterday. Here’s a close up in Figure 7. 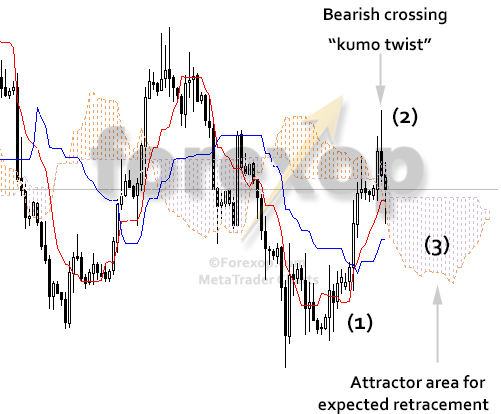 Looking at the kumo cloud: The first thing to notice is that the cloud is displaying a bearish downward crossing at point 2. The fast line has passed down, through the slow line. This is called a “kumo twist”. The purple shaded area is therefore expected to act as a price attractor, pulling it downwards. The flat area at the top of the cloud creates support but the price has already made a significant break below this level at the current bar. Given that the price has breached this pivot line on the cloud (top edge), there’s now a likelihood of retracement into area 3. Remember this line is also the 50% Fibonacci retracement level (over 52 bars in this example). One break below has already taken place. So we can say based on the kumo that a downward retracement is more probable than a further upward leg at this point. Looking at the equilibrium lines: An upward crossing happened at point (1). This was bullish. This leg now appears to be exhausting as the top of the fast line (red) is already flattening. Putting this together, a kumo trader would go short (sell) at point 2 based on these signals. Figure 8 shows a snapshot of the chart 36 hours later. Click the picture to open an enlarged view. The price has indeed descended back into the retracement area as expected. The top of the red line did act as a strong resistance. Of course, this is just one example. When dealing with probable outcomes it isn’t always going to happen the way you expect. The good thing is though, because the kumo cloud is a forward predictor, you can clearly see where it was correct and where it wasn’t. Ichimoku doesn’t need to be a daunting indicator. Once you group the output lines and get to know their different functions, it is all relatively simple. There are a couple of things I like about Ichimoku. Firstly, the kumo cloud gives you a forecast. This has a solid underpinning in retracement theory and repetitive market dynamics. This is your crystal ball. Secondly, the kumo cloud and equilibrium lines provide decent forecasts of likely support and resistance lines. The fact that Ichimoku uses price extremities rather than averaging means it is better suited to revealing market turning points. Thank’s, it reinforced what I am already learning. Much appreciated. Thank you for the great explanation, cheers!